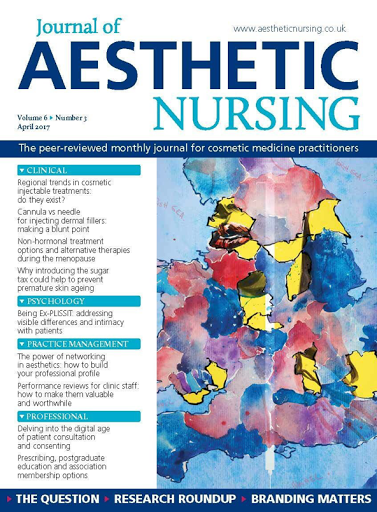 Delighted to have been asked to write the guest editorial for Aprils edition of the Journal of Aesthetic Nursing on the new European Standards CEN in Aesthetics that have been adopted in Ireland. Now that we are coming into spring and the weathers starting to improve, it's time to tackle our winter skin. Many will have noticed that their skin looks tired, dull and lack lustre. This is no surprise after winter weather, fires, heaters and air conditioning. One of the best ways to tackle dull, tired and lack lustre skin is to add a Vitamin C serum into your daily skin routine. Easy peasy! Vitamin C can help to firm and brighten the skin while also evening out uneven skin tone and fading sun spots. 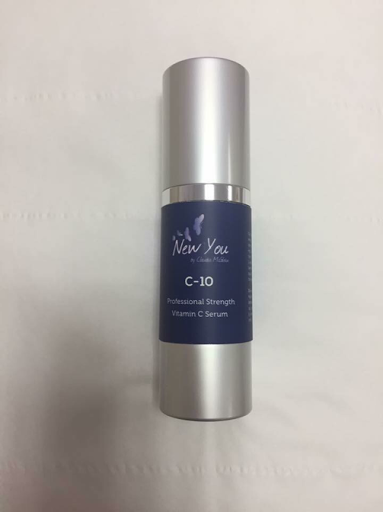 New You by Claudia McGloin has a Professional Strength Vitamin C Serum called C-10. Use daily as part of your skincare routine. This advanced signature C-10 serum used scientific and evidence based formulas, offering daily antioxidant protection. C-10 contains stabilised L-ascorbic acid which is a form of Vitamin C which is easily absorbed by the skin for greater potency. C-10 is one of 8 signature skincare products in the New You by Claudia McGloin Clinic range. This range was a finalist for Best Professional Skincare at the My Face My Body Awards in November 2016 in London. 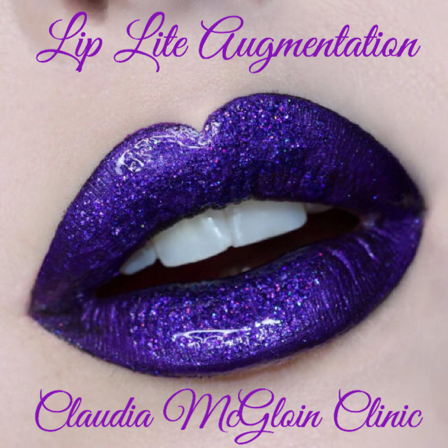 Visit our website www.claudiamcgloinclinic.com for more details on all our procedures including our 4 New You by Claudia McGloin Bespoke Signature Facials. 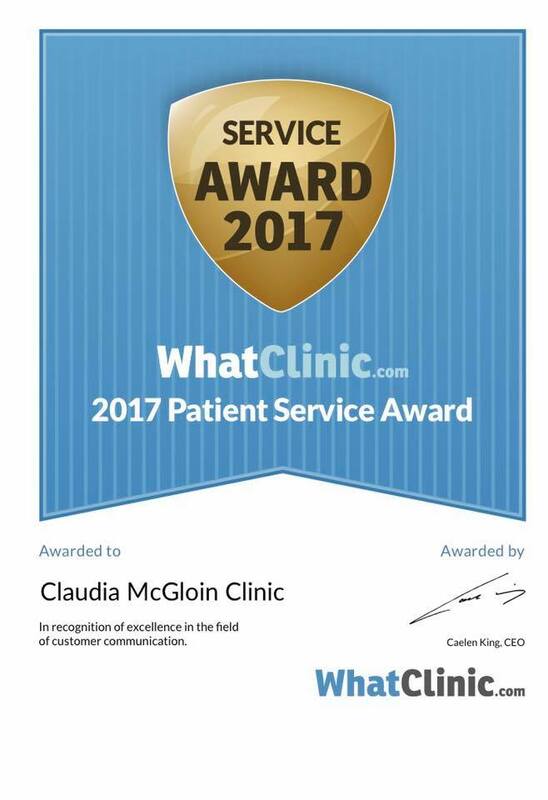 The Claudia McGloin Clinic are absolutely delighted to have been awarded with a Patient Services Award 2017 from WhatClinic. 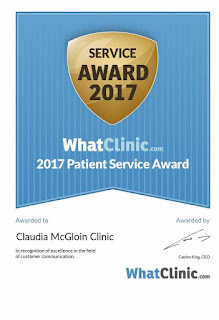 The clinic have been consistent with Customer Service and dedication to Patients Service since we opened the clinic doors 5 years ago in December 2011. We have been awarded a Customer Service Award every year since opening and this is our 6th consecutive award. 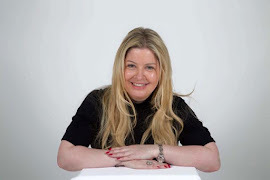 We strive to be the very best at what we do and we are delighted with all of the reviews and comments that we have received over the years from our patients both publicly and privately. We appreciate that our patients don't want to publicly state what procedures they have had and we respect that. We would like to thank all of our patients as we could not do this without you all. We are honoured that you chosen us to do your treatments and that's what makes us Sligo's Premier and one of Ireland's Leading Award Winning Medical Aesthetic Clinics. Stretch marks are long, thin streaks or lines that can develop on the surface of the skin and are a form of scarring. Stretch marks are very common and can affect both men and women. Stretch marks cannot be prevented but there are a few tips that can be followed in order to reduce their development. Stretch marks are medically referred to are Stria or Striae or Striae Gravidarum during pregnancy. Stretch marks don't look alike. They vary depending on how long y...ou've had them, what caused them, the location on your body and the skin type you have. Anyone can get stretch marks but they tend to affect women more than men with around 9 out of 10 women getting stretch marks during pregnancy. It's estimated that around 7 in 10 women and 4 in 10 men develop stretch marks during puberty. Stretch marks occur when the skin is stretched extensively over a short period of time. The rapid stretching causes the Dermis (middle layer of skin) to break in places allowing the deeper skin layers to show through forming stretch marks. The dermis is made up of strong, interconnected fibres that enable your skin to stretch as your body grows. If for example your abdomen grows rapidly over a short period, the fibres can become thin and over stretched and some may break. At that point where the skin fibres break, tiny tears develop which allow the blood vessels below to show through. This is why stretch marks are often red or purple when they first appear. When the blood vessels eventually contract, the pale coloured fat underneath your skin will be visible and your stretch marks will change to a silvery white colour. Before developing stretch marks the affected skin will become thin, flattened and thin. The area may also feel itchy. Stretch marks often appear slightly raised and may feel wrinkly before eventually flattening out. As the lines become flatter they will start to fade and will change colour. Stretch marks can appear in patches of parallel lines on your body. It can take years to fade and become less noticeable.